Welcome to my pet project. Let me give you an idea of what the heck Coverage Productivity is, why I felt the need to explore this area, and then provide the data I accrued from the 2014 NFL season. The first thing that I must mention is how much I appreciate pushing the limits in terms of analysis. I'm not talking about strictly football, either. I like trying new viewpoints and data sets, as I believe we can dig deeper to find out more quality information. The traditional ways of looking at things is, quite frankly, boring to me. I don't really care about how many yards someone had. Tell me about those yards gained, like exactly how they were attained. What was the process of the play? Who did their job and to what extent did they execute? That's why I respect advanced analytic companies like Pro Football Focus. I don't solely rely on that type of data, nor do I believe it's the end-all be all. That includes the data I chart myself. It's all a piece of the puzzle that we can use to form an opinion. Charting plays is something that I've learned to love. I chart quarterbacks and cornerbacks for several reasons. You can find my collegiate charts over on the NCAAF page, as well as my explanation of that process. But since I have you here, I'll talk about the cornerback charting process. There are very few analysts looking at the position in depth. One big issue is the lack of time and film available to people. We see games on Saturday and Sunday from a limited television angle. We cannot see the cornerback until the ball arrives. But there is a major void that we miss when that happens. That void leaves us with limited understanding of the cornerback position, as well as inaccurate ways to measure how well a cornerback plays. Seriously, all we have to work with in the traditional box score are interceptions, tackles and passes defensed. That doesn't explain what actually happened, nor how good an individual is. The problem is that a great cornerback is less likely to be targeted. Thus, they have less opportunities to get an interception. That's a natural limitation of judging based of statistics. Every interception can vary in form, as well. Same for touchdowns allowed. When Dez Bryant does this, the cornerback provided good coverage and forced an insane catch. We shouldn't hold that against the cornerback when the offensive player makes an incredible catch. Here is an example of winning coverage. That's why I created the Coverage Productivity concept. 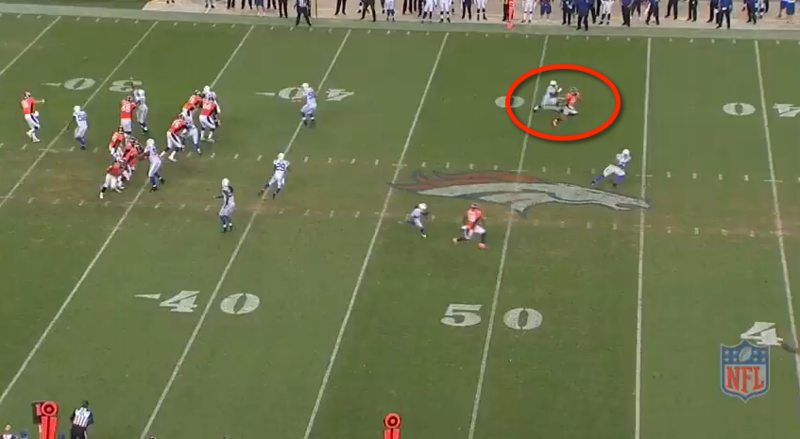 I want to see exactly how effectively a cornerback provides coverage on every route. If the cornerback is within an arms' length of the receiver at the top of their route, they are very likely to earn a win. The other way they can earn a win is if they play a well-thrown ball to perfection to help make up for any mistakes throughout the coverage process. Competing at the catch point by forcing a very difficult catch or even knocking the ball away is likely to earn a win. On the other hand, there are clear losses that don't necessarily lead to box score statistics. A dropped ball shouldn't erase the fact the cornerback was beaten. And we shouldn't overlook that a quarterback didn't see his receiver breaking open, or delivering an uncatchable ball. Even on interceptions, a cornerback can lose but end up with the ball because of poor offensive execution. Here is an example of a clear loss. I only consider man coverage snaps or zone coverages where the cornerback is clearly engaged in the play. That doesn't mean that the cornerback is exempt from a win or loss when they are not targeted. Again, we are looking past what we see on television broadcasts. This eliminates a fair amount of snaps for every cornerback, but it also gets rid of most scheme questions. If I'm not completely sure, I won't chart the play as a win or a loss. That keeps things fair and consistent. It does not matter to me if the throw is accurate. It is all about the space the cornerback gives up when the ball should arrive. 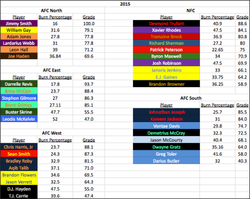 Unfortunately, I wasn't able to chart every single starting cornerback in 2014 due to time constraints. But the data collected is very detailed and thorough. It helps give a picture of what routes are most dangerous to a defense, as well as see what the very best cornerbacks cover well to help themselves standout amongst the rest. With the help of Arif Hasan, we've created an encompassing look at how well cornerbacks play. Arif has been kind enough to give us a weighted scale that takes traditional statistics into consideration as well as the numbers I gathered through film study. His time, effort and knowledge was extremely valuable to this project. For the most part, I'll let the data speak for itself. Although I wouldn't push this data as the perfect answer, it may help give a more complete picture. 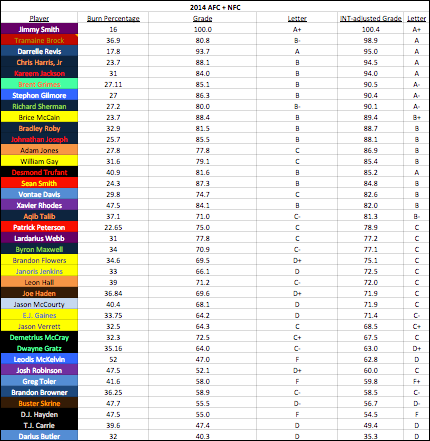 Below you will find the complete data set, as well as a snapshot of the grades. Feel free to send comments or feedback via Twitter. Click here to view the complete data set (new window).